Nevertheless, many of the truly impressive species in our wilderness are rarely seen and there is almost no knowledge of their distribution or abundance. Our Appalachian Eagles project exposes people to wildlife and generates scientific data to estimate the number and distribution of these remarkable animals. 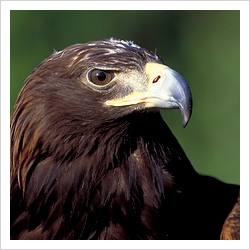 This project started several years ago, when teams of researchers were trapping golden eagles in West Virginia. We began by laying out bait for eagles (usually roadkill deer) and then waiting to trap the birds as they came in to feed. We realized that it would be more efficient to know in advance if an eagle was visiting a bait site. We did this by putting a motion sensitive trail camera by the bait pile, to record eagle visits. We quickly saw that not only were golden eagles visiting our bait piles, but many other species were also visiting – bobcats, coyotes, skunks, bald eagles, red-tail hawks, red-shouldered hawks and vultures. The project then morphed into a wildlife monitoring effort. We began to recruit volunteers from across the Appalachian region, to run trail camera sites and to monitor their local wildlife. As of spring 2012, we have over 150 bait sites spread across the Appalachians, from Maine to Alabama. Each site is different and each attracts slightly different wildlife. However, all are remarkable in the quality and quantity of wildlife we records. For more information on the research conducted by our team and on the individuals involved, please visit the web page for Todd Katzner’s research group.